On October 29, Google will hold its own launch event, conveniently placed around the same time Apple is said to be unveiling an iPad Mini and Microsoft will share details about the future of Windows 8 and Windows Phone 8. Google has traditionally let loose some Nexus news around this time, but it seems likely an Android 4.2 update will be detailed as well. Despite it being an incremental update, a leaked system dump teases quite a few exciting features. None of these are surefire additions, but all are definite possibilities. One of the most obvious, but still very welcome, inclusions is a quick settings section in the notification bar. The quick settings would allegedly be activated with a double-swipe mechanism that would bring down a block of settings. We assume the quick settings refer to toggles for things like GPS, Wi-Fi, and Bluetooth, a feature currently available via many third-party applications. Another exciting, and much-anticipated, addition to Android is multiple user accounts — especially with tablets being purchased for the whole family to use. Android Police isn’t convinced this feature will make it to Android 4.2 (it may turn up in a later version), but it seems to be very close to completion. Each user will have a user name and photo, you can add and delete users at will, fairly basic stuff. Apps will be kept track of through the Play Store so each app list will be customized based on the corresponding user’s chosen applications. Account-specific parental controls will also be supported, allowing the lock down of Play Store purchases or limiting downloads based on content ratings. For this to work Android 4.2 would need to be some sort of lockscreen interface, but there doesn’t seem to be any evidence to suggest exactly how to switch between users. It would be really nice to see face unlock be implemented across accounts, as well as separate Google, Facebook, Twitter, and other social media accounts and saved passwords. Finally, the Gallery app is being redesigned to more closely resemble the photostream of Google+, bringing even more of a unified look to Google’s various software products. 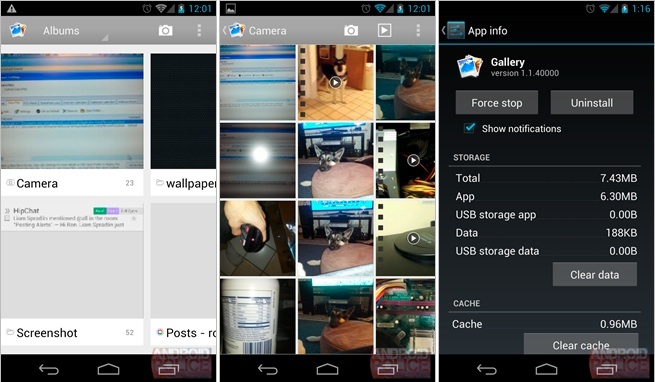 The photo above shows the revamped Gallery app in action, courtesy of Android Police. Some of you may notice a new icon for the app, but this is apparently just a placeholder and will be replaced by the different icon in the final build. As Google’s announcement draws closer we find ourselves becoming more and more excited for Nexus news. Too bad we have Apple and Microsoft’s own announcements forcing us to divide our attention between three compelling events. Needless to say, next week is going to be epic.